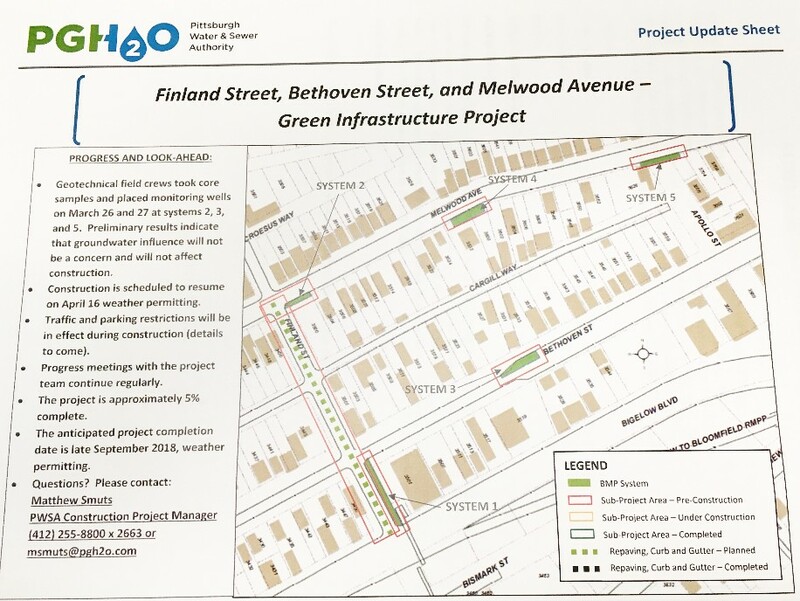 The PWSA project to capture stormwater runoff safely is providing an update. Finland is expected to be closed until October. 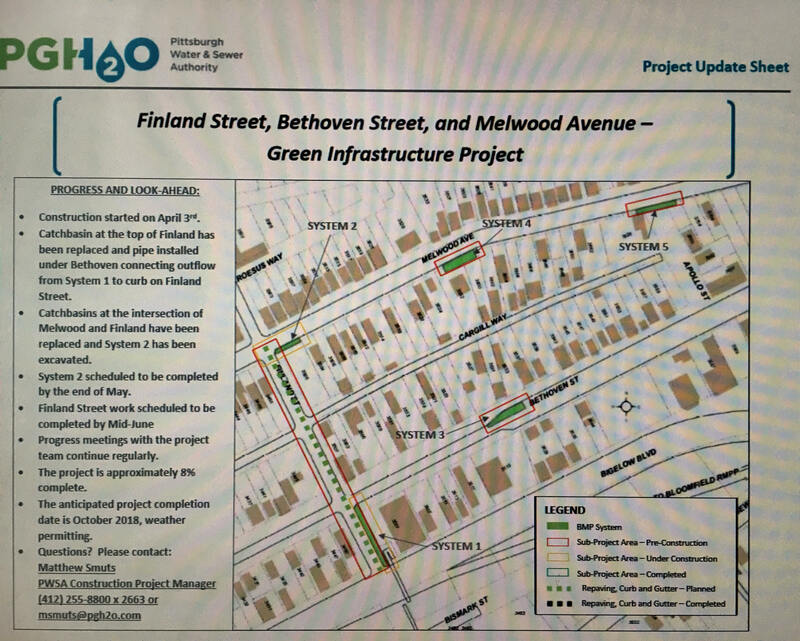 Construction on the Finland-Bethoven-Melwood project to capture stormwater runoff water has started, closing Finland for the next few months. Our PHCA newsletter published a special edition to share lead water information from PWSA, the City, and other resources. Though spring seems ages away, certainly some of us are thinking ahead about spring planting for summer bounty. These tips from Phipps might be useful! With another great year of gardening about to begin, Phipps wants to remind their fellow green thumbs that by purchasing seeds that are organic and non-GMO, you will support purveyors whose products and practices have a more positive impact on human and environmental health. When searching for seeds, a great place to start is the Council for Responsible Genetics’ Safe Seed Resource List, a directory that includes local, national and international GMO-free vendors. Other seed companies recommended by Phipps staff include John Scheepers, High Mowing Seeds, Fedco, andThe Natural Gardening Company. If your goal is to avoid seeds directly linked to conglomerate seed companies, check out the Safe Seed Pledge, a voluntary pledge companies can take to commit to selling non-GMO seeds. On Sat., Feb. 27, Phipps and Grow Pittsburgh will host their Fourth Annual Seed and Plant Swap at Carnegie Library of Pittsburgh in Oakland. This free, open-to-the-public event will include opportunities to obtain open-pollinated, non-GMO, non-hybrid seeds; a hands-on activity for children; a seed starting workshop; and more. Follow the link below for details, and have a happy gardening season! Reuse Fest is a one-day collection event for materials to be reused by local non-profit organizations. The event will take place on Saturday, August 3, from 9:00 a.m. to 1:00 p.m. at the Goodwill Workforce Development Center. The center is located at 118 52nd Street in Lawrenceville. Reuse Fest was started to allow nonprofits in the Pittsburgh area to collect donations of items targeted to their specific needs. This year’s event includes many great local organizations including Global Links, Construction Junction, Off the Floor, Pittsburgh Center For Creative Reuse, Goodwill, FreeRide, the Animal Rescue League and the Gay & Lesbian Community Center. Other materials and items not on this list will not be accepted. Click here for more information, or call 412.488.7490, ext. 236. Here is the flier for the event. Household hazardous waste is that portion of a household product that is no longer usable, leftover, or unwanted and has to be disposed of. You can identify a product as hazardous by words such as CAUTION, WARNING, POISON, or FLAMMABLE on the label. Each person in Pennsylvania produces an average of four pounds of household hazardous waste each year for a total of about 25,000 tons/yr. statewide. If carelessly managed, these consumer waste products can create environmental and public health hazards. If you have materials at home that are not usable, you can dispose of them responsibly by taking them to the Allegheny County Household Chemical collection day. 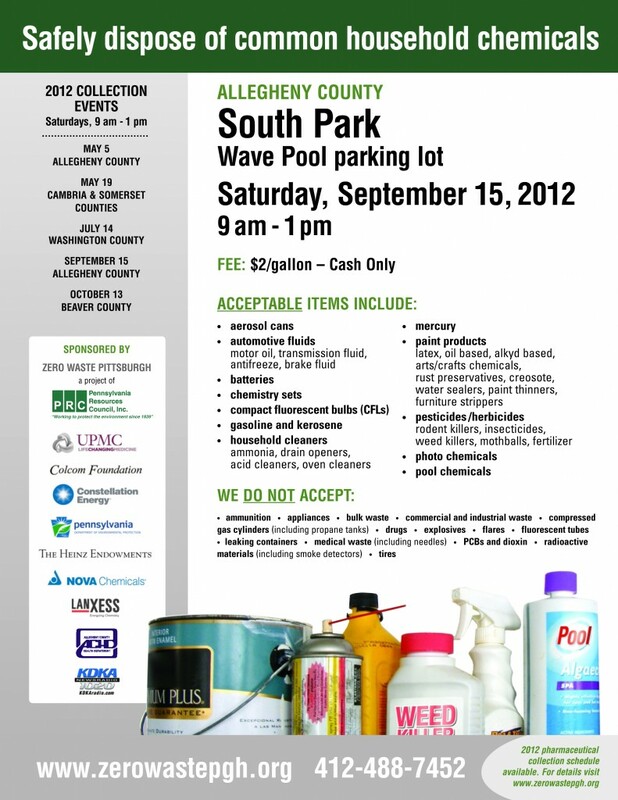 The collection is on Saturday, September 15 at the South Park Wave Pool. Collection will be from 9:00 am to 1:00 pm. The participant fee is $2 per gallon, cash only. Please consider getting a group of friends or neighbors to pool their items for the collection. Items in leaky containers will not be accepted. If possible, transfer materials to a new container. Preserve the label and place in a zippered plastic bag to keep with replacement container. Here’s more information and a list of items that will not be accepted. If you have questions about specific products, call the HHW hotline at (412) 488-7452. Here is Zero Waste Pittsburgh’s resource guide on hazardous materials and how best to dispose of them. ReuseFest is a one day collection and educational event focused on the importance of material reuse. The event is an outgrowth of Pennsylvania Resources Council’s popular Hard to Recycle Collection events. ReuseFest is a new and inventive way to bring attention to the relatively over looked issue of reuse. If you consider that each year in the United States 161 million tons of material ends up in landfills and consider of all the energy and resources that it takes to make new products – the benefits to reuse is obvious. Here in Pittsburgh we are lucky to be home to a large number of nonprofit organizations and small businesses that provide wonderful resources to the general public to help them give their goods a second life. Through the ReuseFest the PA Resources Council gets these resources some needed attention in a fun and interactive way by bringing together a large scale collection drive for materials which will increase the support of local organizations, reduce the amount of materials being land filled, and educate the general public on the importance of reduce. All items are collected for FREE. For a more detailed list of what each organization takes please click on their name. Construction Junction – Useable building materials including Windows, Doors, Tile, Ceiling Fans and more. Free Ride – Bikes, Bike Parts, and Tools in working order-(especially screw drivers, wrenches and allen keys). Off the Floor – Kitchen Tables and Chairs, Dressers, End Tables, Bed Frames and Cribs. ReuseFest takes place on Saturday August 11th from 10:00 a.m. to 2:00 p.m. in the Parking lot at 26th and Sidney Streets at South Side Works. For more information, contact Sarah Alessio Shea at412.488.7490 ext.236, or email: saraha@ccicenter.org. 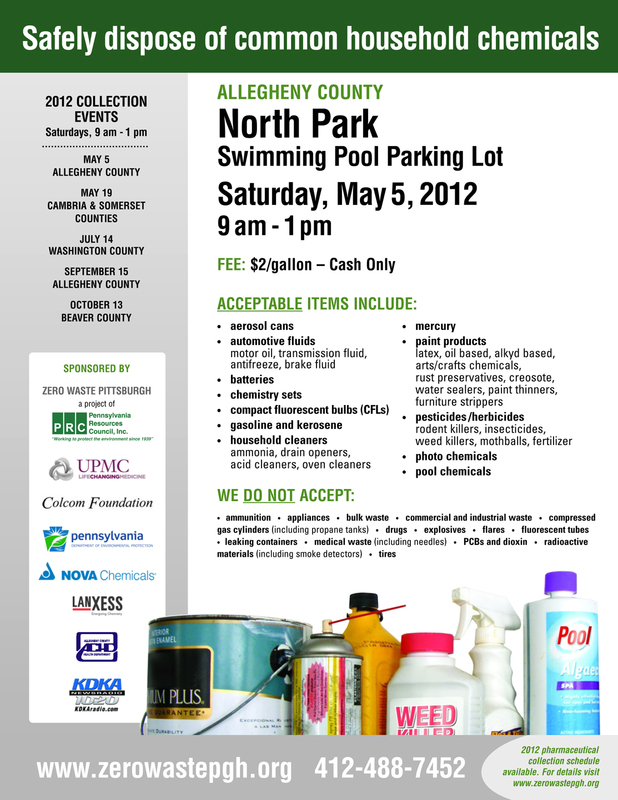 There will be a collection of hazardous household waste in the parking lot of the North Park swimming pool on Pearce Mill Road in Allison Park on Saturday, May 5 from 9:00 a.m. to 1:00 p.m. Items accepted include aerosol cans, automotive fluids (motor oil, transmission fluid, antifreeze, brake fluid), batteries, chemistry sets, compact fluorescent bulbs (CFLs), gasoline and kerosene, household cleaners (ammonia, drain openers, acid cleaners, oven cleaners), mercury, paint products (latex, oil based, alkyd based), arts/crafts chemicals, rust preservatives, creosote, water sealers, paint thinners, furniture strippers, pesticides /herbicides (rodent killers, insecticides, weed killers, mothballs, fertilizer), photo chemicals, and pool chemicals. Items they do NOT accept include ammunition, appliances, bulk waste, commercial and industrial waste, compressed gas cylinders (including propane tanks), drugs, explosives, flares, fluorescent tubes, leaking containers, medical waste (including needles), PCBs and dioxin, radioactive materials (including smoke detectors), and tires. For more information, here’s the flier for the event, and here’s the link to the Pennsylvania Resources Council’s ZeroWaste Pittsburgh event page. If you need to dispose of any electronic items that have gone kaput, there’s an upcoming date you’ll want to note. The Pennsylvania Resource Council‘s project Zero Waste Pittsburgh will be holding an e-waste collection in South Park on Saturday, April 21, from 10:00 a.m. – 2:00 p.m. 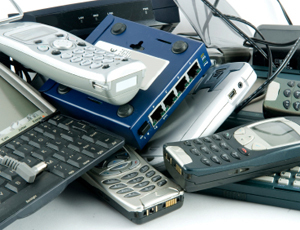 These materials are collected free of charge: Televisions and monitors; CPU towers and laptops; mice and keyboards,;UPS servers and routers; web cameras, hubs, and external drives; VCR/DVD players, stereos, and cable boxes; TiVo, large speakers, DVR’s, and paper shredders; small appliances like toasters and microwaves; compact fluroescent bulbs (CFLs); cell phones; home phones and modems; and ink and toner cartridges. There is a small charge for batteries, floppy discs; VHS and cassette tapes, fluorescent tubes, and small freon containing appliances. Certified document destruction is also available. Click here for the full list of items they take, and any fees. The collection is in South Park VIP parking lot, on Corrigan Drive, Bethel Park, PA 15102. If you have any questions or need additional information, please visit PRC’s Zero Waste Pittsburgh website at http://www.zerowastepgh.org/ZW-PRC-hardtorecycle.html or contact Sarah Alessio Shea at 412-488-7490 ext. 236 or saraha@ccicenter.org. 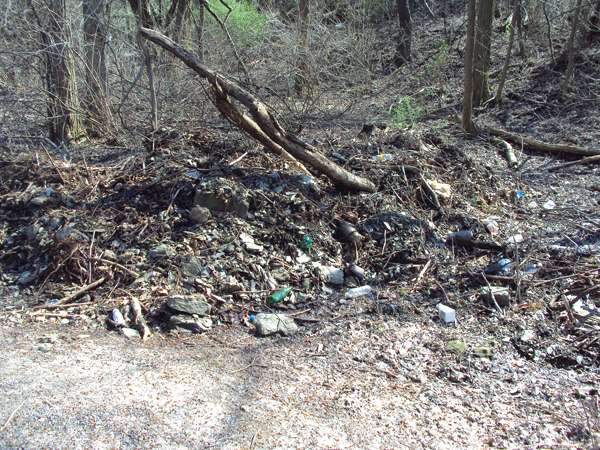 Who is illegally dumping refuse in West Penn Park? 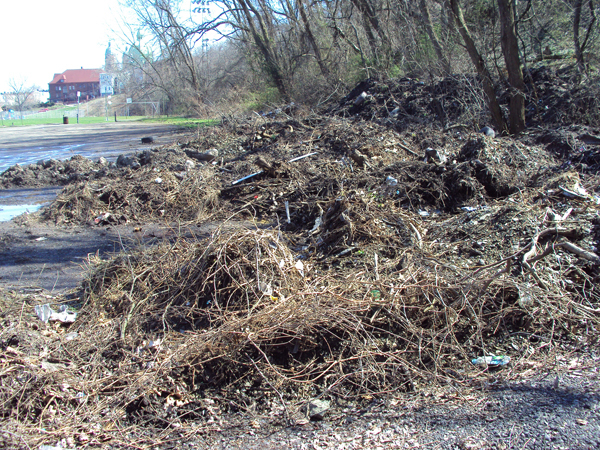 Many truckloads of waste — a mixture of excavation debris, trash, building materials, landscaping debris, and tires — were recently dumped in West Penn Park, covering a sizable section of the lower parking lot off the ball field. All of the heaps and drifts of material in the photo above are dumped refuse. A lot of garbage has also been thrown over the hillside. This location is attractive to dumpers because it is hidden from view from any road or nearby buildings. The site is accessed from the the far end of the neighborhood, around Stockholm street, where there are few houses. 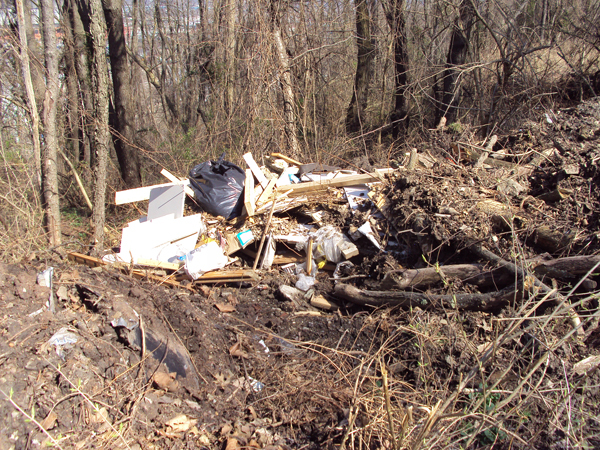 Illegal dumping has been a problem at this location for years. 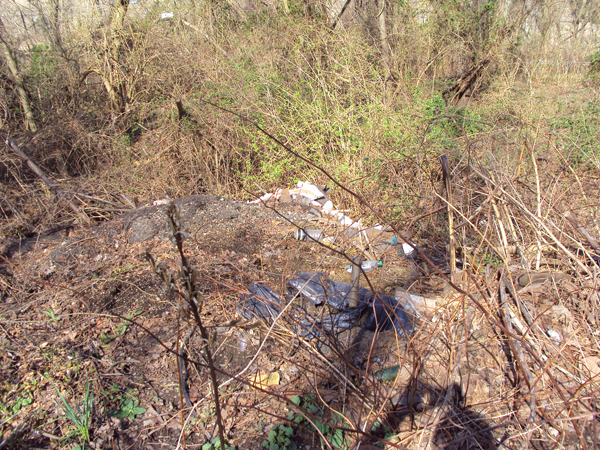 The site is repeatedly cleaned up by neighborhood volunteers and Allegheny Cleanways, but the dumpers keep returning. This is particularly regrettable because West Penn Park is one of Polish Hill’s biggest assets. This unusually large green area, with a wide range of native plants and trees, will soon become part of the City’s Greenway. It’s distressing to see that there are people who see this beautiful park only as a place to dump trash. West Penn staff has been informed of the situation and will be working with the PHCA to identify who is doing this. We are asking all residents who use the field, walk their dogs in the park, or just hike in that area, to keep an eye out. It is illegal for anyone to dump anywhere in West Penn Park. If you see anyone dumping waste here, whether they are individuals, private companies, or even City workers, please note any information that will help us identify the culprits. Copyright © 2019 Polish Hill Civic Association. All Rights Reserved.